The ombre nail color trend is still a huge hit amongst nail art lovers. 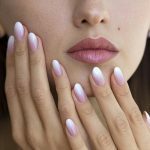 If you want to achieve this gorgeous gradient color look at home, here’s the good news – ombre nails are one of the easier nail art techniques that you can do yourself. Want to learn how? We’ve got a round-up of 15 ombre nail designs with step-by-step guides to make your life easier. 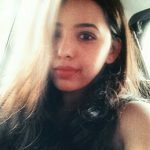 It does take some practice to perfect the effect but, in time, you can master this trend. From a stunning deep red ombre to an ombre French manicure, we’ve got a bunch of designs for you to take inspiration from. Check them out! 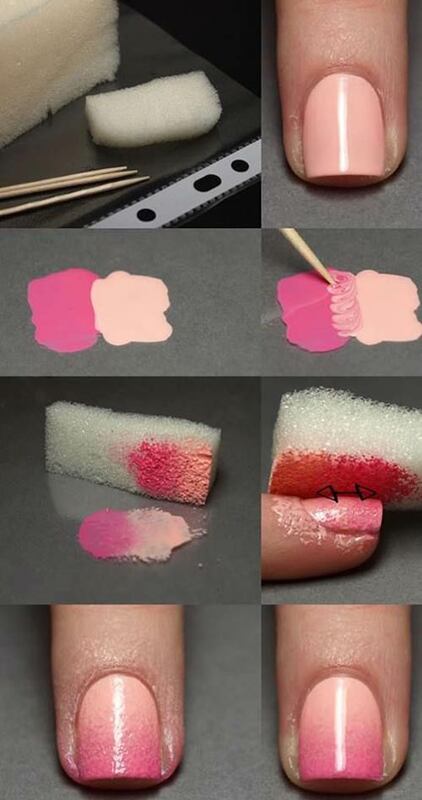 This pink and beige ombre nail design is very simple to recreate. If you are a beginner to nail art, this one is perfect for you. You can choose any two colors belonging to the same family for that stunning ombre effect. Step 1: Start by painting your nails with the lighter nail polish first. Step 2: Lay down some foil or baking paper and pour a little bit of both the colors next to each other. Step 3: Using a toothpick, mix the colors at the center. Step 4: Dip your sponge in some water to prevent it from absorbing the nail polish. Step 5: Dip the sponge in the polish and gently dab it on your nail. Note: If you want a more vivid color, repeat the same step (but make sure your nails are dry before going in for the second layer). Step 6: Apply top coat to seal your manicure. Want to glam up your outfit? This metallic ombre nail design will do the trick. It’s not over the top. In fact, it’s just the right amount of classy! Give this a shot if you have something special coming up. Step 1: Start by painting your nails with champagne or gold glitter nail polish and allow the polish to completely dry. Step 2: Apply some black glitter polish to your wedge sponge and gently dab it onto the edges of your nails. Step 3: Once you’re satisfied with the ombre effect, apply a layer of top coat to secure the manicure. Step 4: Clean up the sides of your nails with a thin brush and some acetone. This blend of pastel colors is a must-try for spring or summer. Doesn’t it remind you of unicorns and all things magical? Also, nothing makes a tan pop like pastel nails. So, try them out with an ombre twist! Step 1: Apply white nail polish as your base. 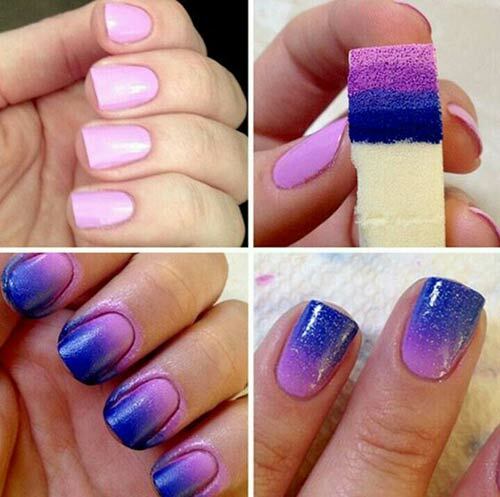 Step 2: Take a piece of sponge and apply strips of lavender, blue, and mint green nail polish to it. Step 3: Gently dab this on your nail and repeat if necessary. Step 4: Clean up the sides of your nails. Step 5: Once your nails are dry, apply some glitter polish over the gradient. Step 6: Finish the look with a high-shine top coat. Looking for a quick and easy way to achieve ombre nails? Try this simple design with two of your favorite colors. This one looks perfect for spring and summer. Step 1: Start by applying a light lavender base coat and let it dry. Step 2: Apply the indigo and purple nail paints to the sponge. Apply both the colors in a broad horizontal swipe and then go over these with narrow swipes. Step 3: Dab your wedge sponge on your nail gently until you create a subtle ombre effect (like in the picture). Step 4: You can add some silver glitter polish to jazz up the design. Step 5: Apply top coat, and you’re set! 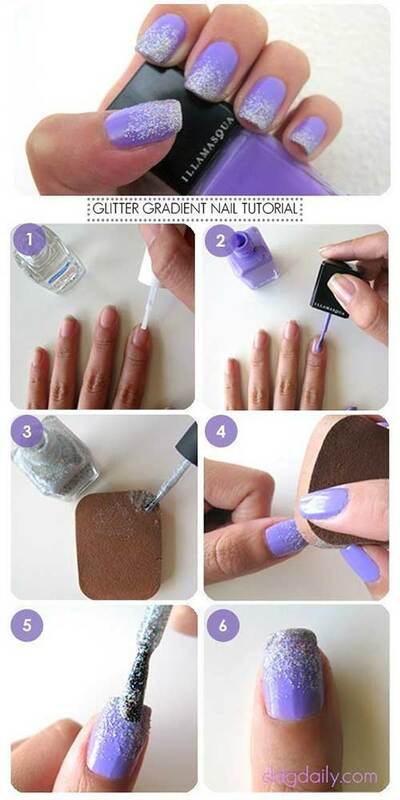 Want to style your ombre nails with a glitter accent nail? This design does that perfectly with a subtle silver glitter nail polish on the accent fingernail. It’s a breeze to recreate and can be done using a set of different colors. Step 1: Start by applying white nail polish for your base. Step 2: Apply the pastel pink and white nail paints on the sponge and dab it on your nail. Step 3: Repeat the same step if you want a more intense ombre effect. Step 4: Apply silver glitter nail polish to your accent nail. Step 5: Secure your manicure with a gel finish top coat. These aqua blue glitter ombre nails are the easiest to create. If you’re a beginner to nail art, this is the design you need to start off with. You only need some blue craft glitter and a little brush. Step 1: Apply a white base coat to all your nails. Step 2: Once your base is dry, apply two coats of pastel blue nail polish. Step 3: While your nail polish is still partially wet, add some blue craft glitter onto the edges of your nails with the help of a brush. Allow your nails to dry fully. Step 4: Apply a top coat to secure your nail art. If your nails need a lift and you need a break from your traditional French manicure, this is something you need to try – because it looks incredibly classy. 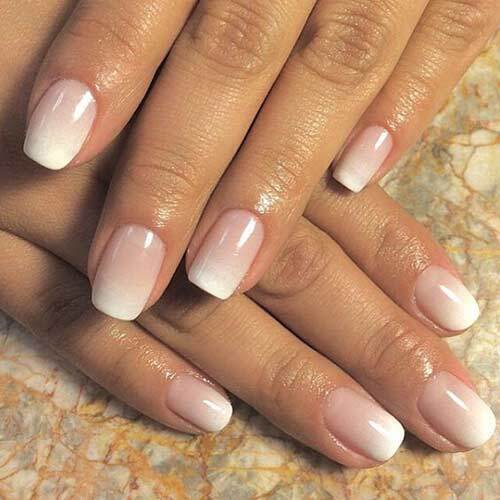 Ombre French nails are all the rage and make for super-chic wedding nails. Step 1: Apply one layer of your base coat. Step 2: Paint your sponge with pink and white nail polish – one stripe of pink and then one slightly narrower white stripe above it. Step 3: Gently dab the sponge onto your nail. Repeat this step until you get your desired color intensity. Step 4: Now, clean up around the edges of your nails. Step 5: Finish with a generous layer of top coat to seal the deal. Show off your vibrant side with these neon ombre nails. Just a heads-up – this design is for the bold ones. If you’re brave enough to experiment with some fluorescent, this nail art is for you. Step 1: Start by painting your nails with pastel teal polish. 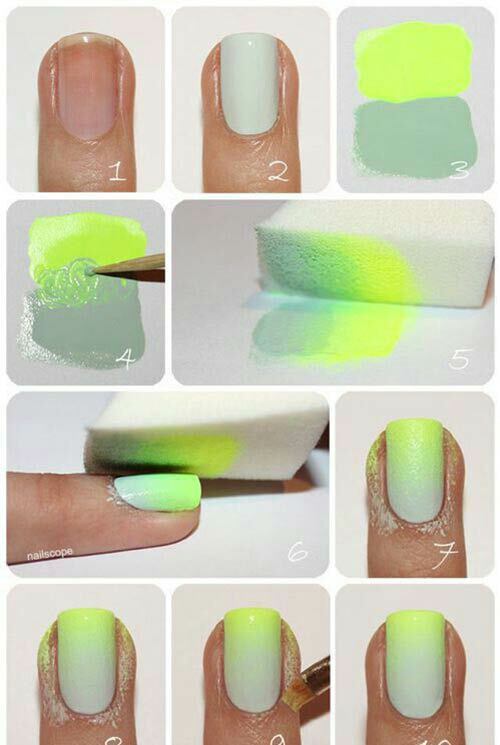 Step 2: Apply strips of the neon and teal polish on a sheet of baking paper. Mix the two colors in the middle using a toothpick. Step 3: Dip your sponge into the polish and dab it onto your nail. Step 4: If you want a more defined ombre effect, repeat the same step. Step 5: Clean up your edges with some acetone. Step 6: Apply top coat to finish. 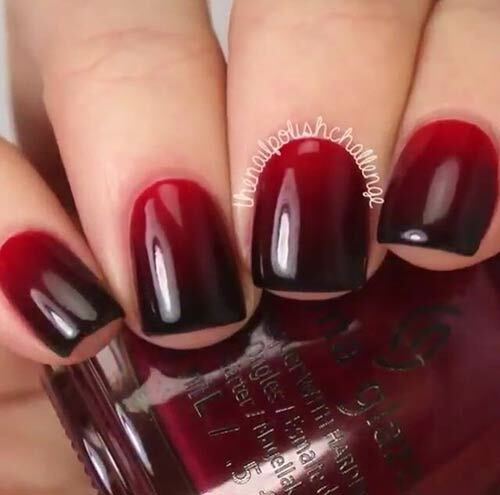 Red and black ombre nails make for the perfect Halloween manicure. If you are not fond of this color combo, you can combine white and red for a more Valentine’s Day feel. The deep red looks extremely stylish and feminine. Here’s how you can recreate this design. Step 1: Apply a layer of base coat and allow it to dry. Step 2: For your base color, apply deep red nail polish. Step 3: Apply the same red and black nail polish onto a sponge. Dab it onto your nails to create an ombre effect. Step 4: Clean up around the nails. Step 5: Apply a gel or a matte top coat. Say you don’t have a sponge or any other tools for your DIY nail art project. You can still do something very cool! These gorgeous watercolor ombre nails do not require any tools. Step 1: Apply a layer of base coat. Step 2: Apply the first color to one half of your nail. Step 3: Now, before the first color dries, apply the second color to the other half of your nail. Step 4: Use the same nail polish brush to blend the two colors. Step 5: Apply a second coat of nail polish and repeat. Step 6: Overlap the colors for a watercolor effect. Step 7: Finish with a top coat. If you want to enhance the ombre effect on your nails, you can always use three colors for your project. It’s not complicated, but it does require some skill to get that seamless finish. Step 1: Apply a layer of base coat and let it dry. Step 2: Apply blue nail polish to the upper half of your nail. Step 3: Before the blue dries up, apply purple nail polish to the bottom half of your nail. 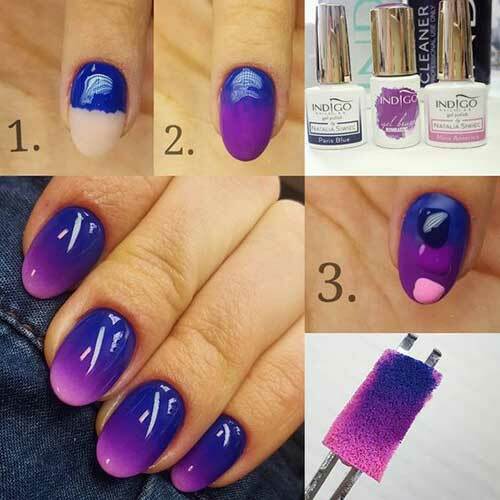 Step 4: Once your nails are dry, apply three dots of color vertically onto your nail – blue, purple, and light pink. Step 4: Gently dab a sponge onto your nail to blend the colors. Step 5: Apply a gel finish top coat. If you like lighter shades, these ombre sorbet nails are made for you. Using two subtle pastel shades, you can create a beautiful ombre effect that’s perfect for daily wear. You don’t even need a sponge to do this. Step 1: Apply your base coat. 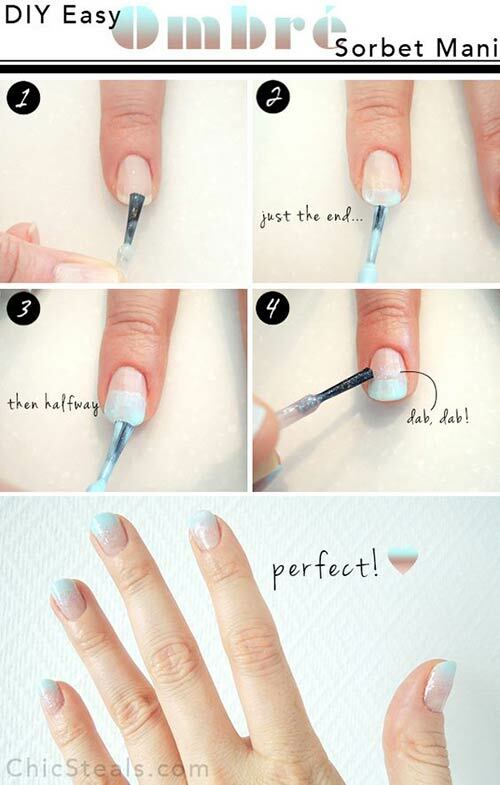 Step 2: Apply pastel blue nail polish to the edges of your nails. Step 3: Once this dries, apply the same pastel blue color halfway across your nail. Step 4: Gently dab the polish to get rid of any harsh lines. Step 5: Apply a glitter polish and allow it to dry. These glitter gradient nails can be recreated with any color. Lavender makes for the ideal shade for spring or summer, and the silver glitter complements this color extremely well. Step 1: Start by applying a layer of your favorite base coat. Step 2: Apply two coats of lavender nail polish. 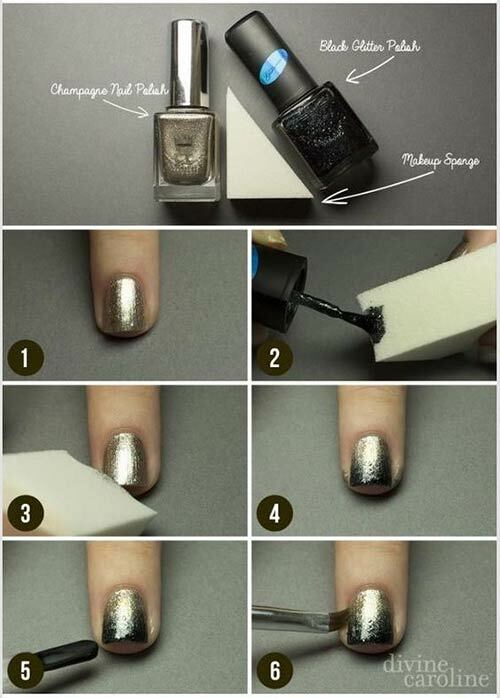 Step 3: Choose a silver glitter polish and apply it onto the edge of an old makeup sponge. Step 4: Dab the sponge onto your nail and repeat if you want to add more glitter. Step 5: Apply a layer of top coat to secure the polish. 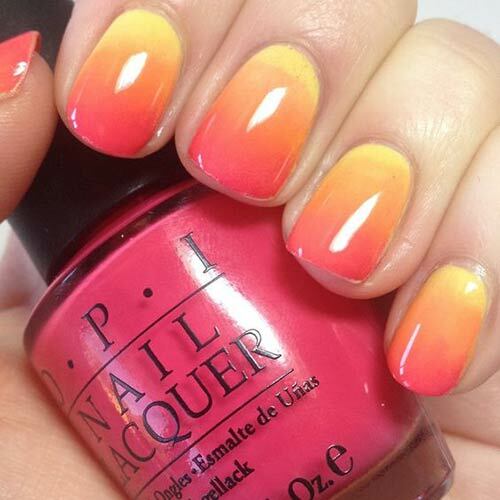 This ombre nail design is a must-try for your next beach holiday. The yellow, orange, and pink blend beautifully to give you this summer sunshine look. Step 2: Apply a white base color for the best gradient opacity and allow it to dry completely. Step 3: Now, apply three stripes of color on your makeup sponge, allowing the colors to overlap a little. Step 4: Dab it over your nail and let the first layer dry. Reapply the colors onto the sponge and repeat the step. Step 5: Finally, finish off with a top coat to help blend the gradient. You don’t need a sponge for a watercolor ombre effect. You can try this design with any of your favorite colors. 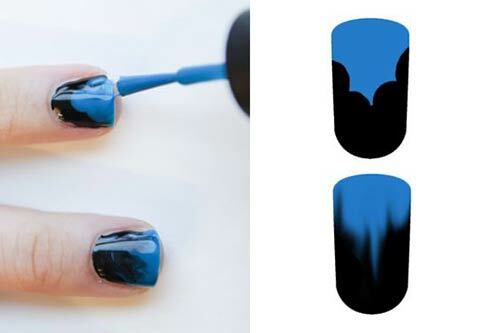 Step 2: Apply black nail polish on the upper half of your nail, creating a cloud as seen in the image. Step 3: Apply blue polish to the bottom half of your nail. Step 4: Using a brush, blend the colors in the middle to create an ombre effect. Step 5: Apply a layer of top coat. Now that you have so many cool designs to choose from, here are a bunch of tips and tricks that will come in handy to give you salon-like ombre nails at home. Always start by applying a clear base coat to protect your natural nails from being stained by colored nail polishes. This little trick also helps extend the life of your manicure by preventing it from chipping. Allow your base coat to dry completely before applying any nail polish to it. You don’t want your manicure to turn into a smudged mess. Always apply two to three layers of nail polish (instead of going in with one thick layer) for a flawless finished look. Your technique of applying nail polish to the sponge is very important. Don’t apply too much as it will leave you with a very shoddy gradient effect. 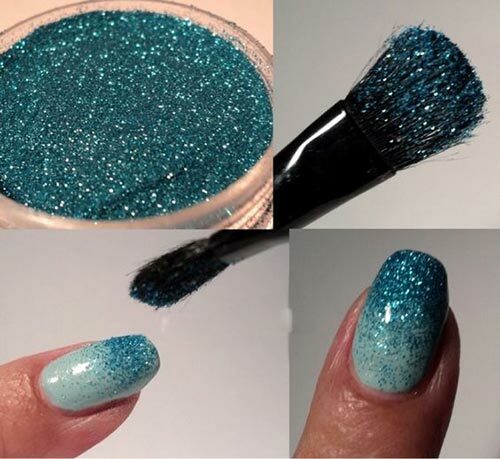 You can always use your old makeup sponges and brushes to do glitter ombre manicure. Apply liquid latex around your nails to protect the skin there and to also make cleaning up a whole lot easier. To clean up any polish remnants around your nails once you finish your manicure, use a small makeup brush dipped in acetone. Ombre nails are perfect for any occasion, and the colors you choose completely depend on your preferences. It’s a good idea to use colors from the same shade range, like light pink and hot pink. However, colors like black and red look fabulous when you’re going for an ombre effect. 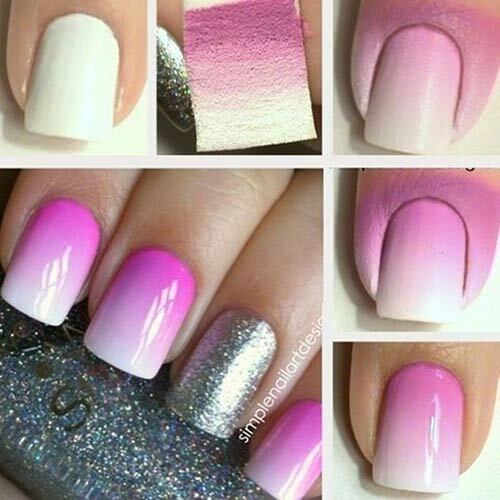 Ladies, that was our take on DIY ombre nail designs. Which one is your favorite? Let us know in the comments section below.